Over the past decade, retail electricity prices have not closely followed the costs of fuels used to generate electricity, such as coal or natural gas, mainly because of changes in the other costs involved with producing and delivering electricity in the United States. The average retail price of electricity in the United States has risen about 1.5% per year between 2006 and 2016, about the same as the 1.6% per year general rate of inflation over those years. In contrast, natural gas prices for U.S. electric generators, a key component in the cost of generating electricity, have fallen at an average rate of 8.4% per year since 2006. The cost of electricity reflects money spent on generation, transmission, distribution, and other plant-in-service additions, as well as plant operation and maintenance. Over the past decade, the portion of total electricity costs attributed to power production for most utilities has decreased from 69% to 54%, while the portion associated with delivering that electricity to customers has risen. 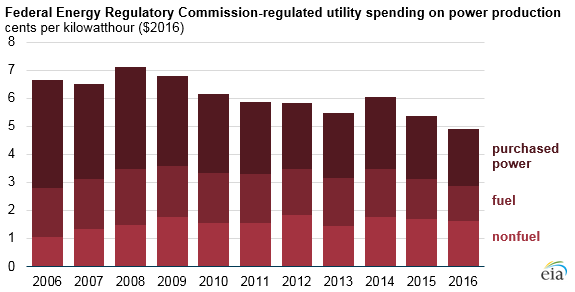 These costs are based on financial reports filed with the Federal Energy Regulatory Commission by major utilities and represent about 70% of all electric utility spending. Power production costs incurred by utilities include fuel costs; nonfuel costs, including the costs of building, upgrading, operating, and maintaining generators; and the costs of purchasing power from independently-owned generators or from power markets. While the fuel and purchased power costs have decreased over the decade with the decrease in natural gas prices, nonfuel costs have increased slightly. Transmission and distribution costs have risen for several reasons. In many areas, aging electric infrastructure has been replaced with new equipment that allows utilities to repair faults on transmission lines remotely, to read meters remotely, and to more quickly find, repair, and communicate with customers about neighborhood reliability problems and outages. Other infrastructure has been built to improve reliability and resiliency, to connect to new sources of electricity generation (including wind and solar), and to reduce transmission-line congestion in quickly growing areas. Other costs associated with electricity, such as administrative and general expenses, have also risen by 20% in real dollar terms since 2006, but these costs account for a smaller portion of the overall costs of providing electricity.